(Nanowerk News) Applied Materials, Inc. today announced the extension of its successful Applied Reflexion® GTTM CMP (chemical-mechanical planarization) system to include the planarization of tungsten films. This CMP process is critical to fabricating the transistor contacts and vias in advanced DRAM, NAND and logic devices. With the Reflexion GT system's proven dual-wafer architecture, customers can achieve unmatched throughput and more than 40% lower cost-per-wafer than competing systems. Importantly, Applied Materials is the only tungsten CMP system manufacturer to provide closed-loop film thickness and uniformity control - a vital capability to achieve high yields of today's advanced transistor structures. "Fabricating advanced chips is becoming increasingly complex, requiring more tungsten CMP steps and more sophisticated process control. The Reflexion GT system can help chipmakers meet these challenges with superior on-wafer performance at a sustainable cost," said Lakshmanan Karuppiah, general manager of Applied's CMP business unit. "The rapid adoption by customers of our innovative Reflexion GT system for copper applications has demonstrated the value of the dual-wafer concept and resulted in significant market share gains, further extending our leadership position in this critical chipmaking process." Key to the Reflexion GT system for tungsten is its dual mode architecture that enables two wafers to be processed simultaneously on each platen to deliver unmatched throughput and 40% lower cost-per-wafer. The Applied Reflexion GT platform, launched in late 2009, set new benchmarks in CMP performance and productivity. The system's unique dual-mode architecture enables two wafers to be processed simultaneously on each polishing pad to boost throughput and significantly cut consumable costs. The system's sophisticated, real-time profile and endpoint control technologies enable superior profile control and repeatability. According to market researcher Gartner Dataquest, Applied Materials was the clear market leader in CMP in 2010. Applied has more than 3,000 CMP systems at customer sites worldwide, backed up by the industry's largest service and support network to optimize equipment uptime and factory efficiency. 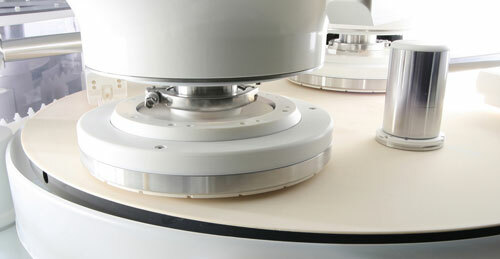 For more information on the innovative Reflexion GT CMP system, visit www.appliedmaterials.com/reflexion-gt.